For the first time the Club now has its own water – the Hallowell section of the River Trent, above Stoke Weir. 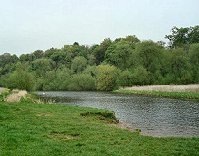 The fishery is rented from Radcliffe Parish Council, which now owns the land, and comprises about 800m of the Trent as well as a natural pond complex. Day tickets will be sold on the bank from June 16th. Be aware that access involves two (alternative) flights of steps, one by the Rockley Memorial Park and the other at the end of Valley Road. We recommend taking the minimum amount of tackle! Get severely tested by the very occasional river carp! 6. Removing (or introducing) fish, or transferring fish from river to pond, or vice versa. Fished last Sunday after a long time off. Had a wonderful day teaching my son the basics. Will be joining soon.